The majority of advertisers surveyed revealed that they plan to increase their paid social media advertising budgets for 2013. As social media use continues to explode among U.S. users, marketers are following closely by investing heavily to stay in front of their customers. When it comes to keeping up with consumers, brands are putting their money where their mouth is. Paid social ads are appealing because you can use them to target the right audience, increase traffic to your website and gain new customers for your business. However, before you start using this tactic, make sure that your social media presence justifies your planned spending. Keep in mind that it’s not just the actual ads that will cost money—you’ll also need to account for headcount (people to execute, monitor, analyze and report performance), tools and quite likely outside consulting. Remember also that your budget should be allocated to the social network(s) where your target audience frequents most! 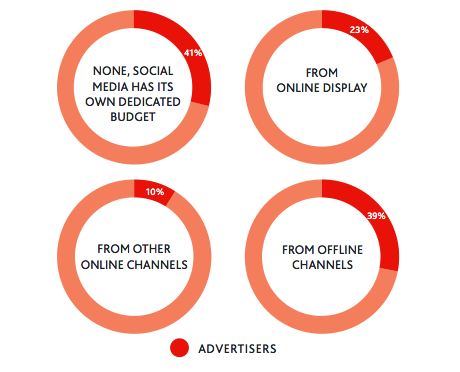 While 41% of advertisers have a dedicated budget for social media marketing, a clear majority said that they would only be able to increase their social media budget for 2013 by pulling resources away from other channels. For example, 23% said they would pull budget dollars away from online display ads, 10% from other channels such as video and rich media (digital ads that contain images or video and involve some kind of user interaction) and 39% from offline marketing budgets. Increased budgets for paid social ads means that other channels are receiving fewer dollars. Let’s face it. There are way too many marketing tactics and not enough money to go around. If there’s a marketing tactic that’s not working for you, maybe now is the time to pull the plug on it and try something new. Why not take a look at your overall budget for both offline and online campaigns? Find out which channels have been performing sluggishly in the past year and then make a decision to divert resources away from those channels to paid social ads. But again, make sure that this shift in strategy supports your marketing goals. Even with dedicated social media marketing budgets, a large majority of marketers use free tools including Facebook, Twitter and YouTube. However, paid social media advertising is also on the rise with 75% of advertisers using sponsored content (e.g., promoted tweets) or purchased media (Facebook ads). 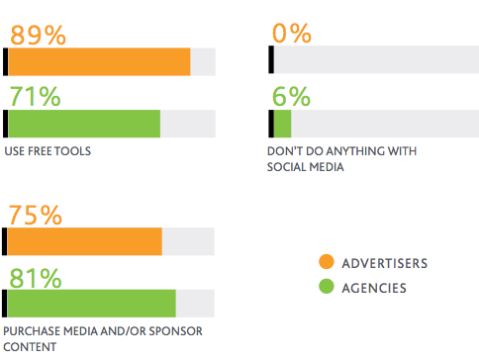 Surprisingly though, agencies are relying more on paid social media than on free tools. Free tools are still more widely used than purchased media. Before you spend any money on paid social ads, make sure that you have fully leveraged the free tools available for engagement (Facebook, Twitter, YouTube, etc. ), social listening and monitoring (e.g., Google Alerts, SocialMention, HootSuite, etc.) and analyzing performance (e.g., Google Analytics). Then if you want to extend your brand’s reach even further, you can look into purchased media channels such as Facebook Ads, Promoted Posts, Promoted Tweets and LinkedIn Ads. Remember that ad agencies have a lot of experience in this area (as with other types of advertising) so they could be a useful resource for you if you’re new to the world of purchased media. Advertisers are increasingly viewing paid social media advertising as an integrated, cross-platform tactic, and are running it in conjunction with other online and offline media. For example 66% of advertisers said they use paid social media combined with other online ads [online display (83%), online video (46%) and mobile (40%)], and 51% said they run it together with offline advertising [print (52%) and TV (37%)]. Agencies showed a similar pattern of usage. Paid social media advertising is only a part of the total marketing mix. It’s not wise to put all your eggs in one basket. Cross-platform marketing allows you to spread your message across many different channels where it can reach more people and have a greater impact. Of course your website should be your primary communication tool with customers and prospects. However, do keep up with the latest trends and insights on social media marketing to ensure that you’re getting the biggest bang for your buck on Twitter, Facebook, Google+, etc. If you want to discover new audiences, consider using other forms of offline and online media including mobile apps, podcasts, in-person events, print publications and so on. Marketers are investing in a wide variety of online and offline marketing channels, not just social media. Hence they want to be able to use the same kind of metrics across different platforms so that measuring their overall marketing performance can be more consistent. 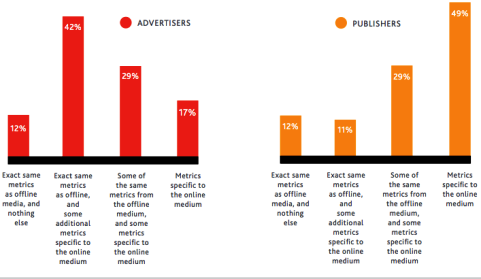 What marketers want—uniform metrics to measure their offline and online campaigns. The problem is even though likes, repins and click-through rates have been used in the past to measure paid social media ad ROI, these metrics cannot track sales and brand lift. Unfortunately media sellers typically offer online-specific metrics, so there’s a clear gap between the types of metrics marketers want and what is currently available to them. Since your social media fans and followers are “soft leads,” you need figure out a way to send them to your website and turn them into “hard leads.” One way to do this is to link your paid social ads to a landing page that has a registration form for collecting names and email addresses. Take a look at how Marketo is creatively integrating Facebook promoted posts with lead generation tactics. 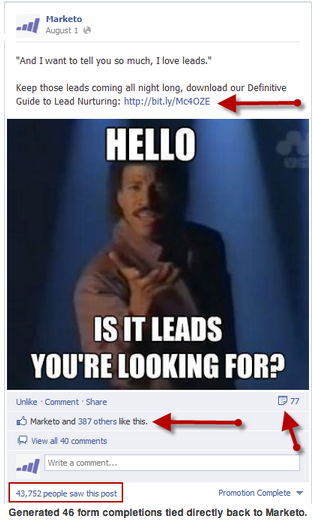 Marketo has a great strategy for linking their Facebook promoted posts to a landing page for “hard” lead generation. Advertisers (58%) and agencies (65%) said that “clarity around how to measure ROI” would lead them to spend more money on social ads. The problem is so bad that 14% of brands admitted “no one” monitors the ROI of their paid social media efforts. Social media measurement is still as fuzzy as ever. The only way to prove that your marketing efforts (both on- and offline) work is to measure, measure, measure. Unfortunately the lack of clarity regarding “what to measure” and “how to measure” makes this a complicated process. Part of the burden rests with media sellers—they need to offer metrics that are more helpful and relevant to marketers. However, marketers should also understand that there’s no single tool that will measure everything at once. The best you can do is to understand clearly what your needs are for each channel and then focus on the best tool to track that effort. 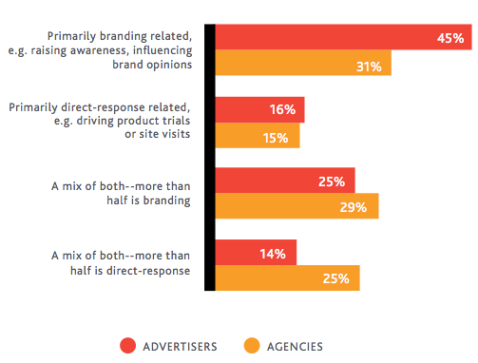 Brand-related objectives (e.g., to raise awareness or influence opinion about the brand) were the main reasons for using paid social media ads among advertisers and agencies (45% and 31%, respectively) while only 16% and 15% of advertisers and agencies respectively were using paid social ads for direct-response objectives (e.g., to increase website traffic and drive product trials). Brand-related objectives are a top priority for marketers using paid social ads. This particular finding is consistent with another study by Ad Age, which showed that marketers use Facebook Ads to drive brand awareness more than anything else. Facebook for example is a tough space for pushing links back to your website. No wonder marketers would rather focus on engaging their fans and influencing them with positive sentiments about their brands. Here are some tips for maximizing Facebook campaigns and raising brand awareness with Facebook Ads. Even though paid social media advertising is relatively new territory for many marketers, there is reason to believe that this tactic will continue to grow especially if media sellers can offer the types of metrics marketers want. The findings show that digital marketers are increasing budgets and using social media in conjunction with other forms of advertising in order to stay in front of consumers. Unfortunately they remain skeptical about social media return on investment (ROI), with a large percentage of them saying they are unsure how to measure their marketing efforts. In the meantime, you don’t have to wait for a perfect scenario to get involved in this space. Pull back resources from other marketing tactics that are not performing well, and try some simple but interesting methods for raising your brand’s awareness through Facebook promoted posts or Twitter promoted tweets. What do you think? Do you use paid social media ads? Which of these insights can you relate to? Please share in the comment box below.